With the installation of more and more applications Windows becomes slower and slower. InControl is a program that will help you control what is started on Windows startup. You can add new items to the startup or edit the settings of the ones already there. Add a program to the Black List and forget about it. InControl will make sure this application never bothers you again. Don't worry about mistakes. The History Viewer remembers all the changes you make and you can go back to any of the previous states of the list at any time. Heal the wounds your Windows got fighting evil programs with the Heal My PC feature. Want your PC to startup and operate faster? Chameleon Startup Manager is a Windows startup manager that accelerates Windows startup and ensures smoother running of the operating system. 1st Startup Manager helps manage your startup applications and provides information on programs that run when you start up Windows. When Windows starts it may automatically launch a number of additional programs. 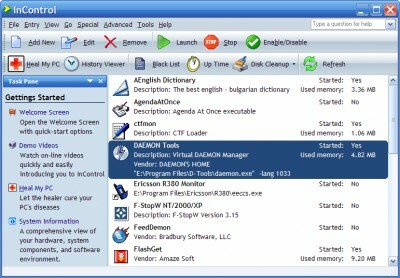 Absolute StartUp manager helps you to handle Windows autorun programs. StartUp Manager - take control of your PC and easily turn off any program that starts with Windows -- even those that don't appear in the Windows Startup folder! Improve your PC performance! Benefits of StartUp Manager: - View and select the programs that are running in the background and starting with Windows. ID Startup Cleaner is an essential utility that provides the opportunity to control, manage and optimize items in Windows Startup. Quick StartUp organizes applications that auto-run using Registry, Startup folders in the Start menu and Win. EF StartUp Manager - When starting Windows, a number of other programs are also started.